Floor standing kiosks are a great way to introduce interactivity, without the permanency of a wall fixed touchscreen installation. 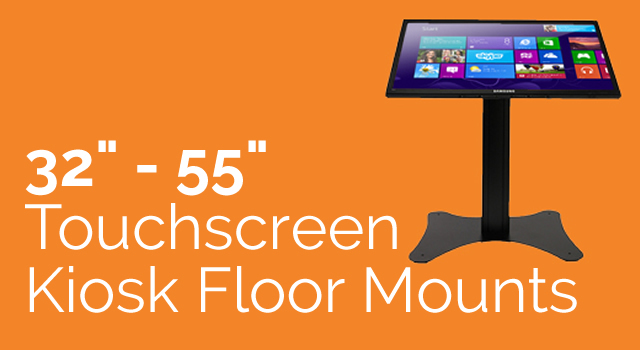 These floor mounts allow kiosk movement, portability and transport, making them ideal for exhibitions or reception areas. The ability to move the touchscreen means that you can experiment with traffic flow to position your touchscreen in various areas to test the best place for optimum usage. Using our expert product knowledge, we can tailor a floor mounted touchscreen package to suit your budget and needs. We can provide advice and suggestions on content setup or multi-touch software. With our first-hand experience of the many different types of large touchscreens on the market, we can guide you to a solution that best matches your environment, such as lighting conditions, ruggedness, security and portability.